If you’re looking for Loudoun lawn service and landscaping companies that will truly bring out the full potential of your outdoor living space, contact the pros at Complete Lawn Service. At Complete Lawn, we turn your ordinary outdoor space into an extraordinary one. 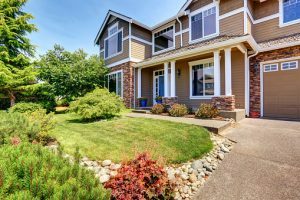 You’ll not only come home to a beautiful and professionally designed and maintained landscape, you’ll see an increase in your home’s value…studies show that homes with professionally designed landscapes bring a return of 15% over similar homes. Lawn Care. We don’t just mow your lawn weekly and edge it every other week. We maintain grass height for the time of year, bag and recycle clippings, and weed-whip areas mowers can’t reach. We also have multiple lawn care programs that roots out weeds and insects for a lush, green lawn, and our shrub and bed care programs keep your plants trimmed and beautiful too. Landscaping. Express yourself and your outdoor lifestyle with a well-balanced and functional arrangement of plants and other features. Trust us and our years of experience with your hardscape design too…we can do walkways and patios that stand out visually and provide functional value. Irrigation. Watering your lawn and landscape is among the most important aspects of a beautiful outdoor space. Let our Certified Irrigation Designer professionals design and install a top notch sprinkler system specific to your property, one that keeps water where it should be and conserves as much as possible. We maintain your system year-round and we can repair and upgrade your system as needed. That’s not all that separates us from other Loudoun lawn service and landscaping companies. We also rid your property of those pesky Virginia mosquitoes with environmentally friendly sprays, and we can even clear snow and ice from your home or business in the winter months. Complete Lawn Service looks forward to creating an exceptional and beautiful outdoor space for you and your family. Call or fill out the online form today for a complimentary consultation.